Would you play a game if you knew that the other team would lose every time? The obvious answer is no. None of us would want to do that because there wouldn’t be any challenge. What would be the point if there wasn’t a risk of failure? Well, the same idea applies to commercial playground equipment. Risk is a necessary part of play. It is the challenge that keeps things interesting, without being too easy. On a developmental level, the purpose of play is to safely learn how to function in society, to learn to assess risks and to make decisions about how to proceed. Children meet, interact and imagine together – testing out their interactions with each other, but also learning about themselves and their limits through playing in their environments. While we can agree that actual hazards are dangerous, we can also agree that children have never been as monitored and regulated as they are now. Some of us remember how free we were as children. We could explore and discover our environment with other children, outside of the supervision of adults, so long as we returned when the streetlamps or porch light would go on. Unfortunately, these freedoms are not usually given to the children of today. The wooded lot behind the house has long ago been developed into more housing, and the open spaces have become parking lots. The place for children to rediscover nature, explore and play are the parks and playgrounds of their communities. Even the playgrounds that children have access to are strictly directed and limited of imagination and active play. A traditional, linear design sends a clear message: climb up here, turn the wheel, slide down, repeat. There is no room for deviation. The deck platforms are stationary, offering no change in the climbing experience. The problem with this type of equipment is that without an element of challenge built into the game, children will ultimately create their own challenge, i.e. climbing up the slides, scaling the roof, etc. 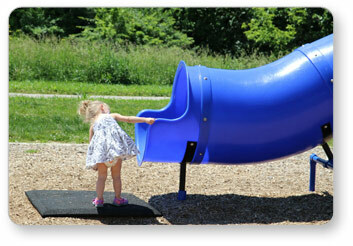 When children use the equipment in ways that were unintended, they increase the potential of injuring themselves. Interested in finding out how to safely bring the challenge back to the playground? Stay tuned for the conclusion of this article.